Presentations can be incredibly persuasive, and particularly in business, whether for closing candidates, pitching investors to fund raise, interviewing with the press and so on, they can materially impact the course of a startup. But it’s really hard to tell a good story. 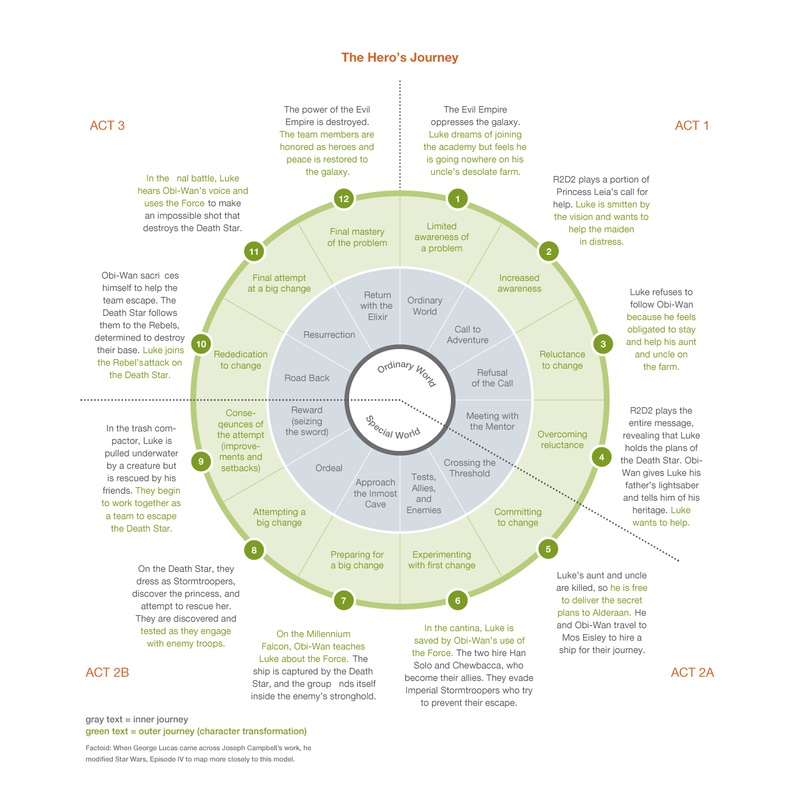 Most of us have never studied the craft of constructing a story: how to draw the arc of the storyline, how to elicit emotions with dramatic tension, or how to entice the audience into conspiring with us in the plot. The best book I’ve found on building compelling presentations is Nancy Duarte’ Resonate. In Resonate, Nancy explains the three different key components of memorable, effective pitches: the journey the speaker would like the audience to traverse, the framework for creating a good story, and the mechanism to bring the two together. Duarte argues a successful presenter convinces the audience to believe in a new idea. To achieve this goal, the presenter must deliver a compelling story that paints the ordinary world of today and contrasts it with the special world of the future. The presenter must call the audience to embark on the adventure, handle their immediate objections to this invitation, and then establish the presenter as the mentor through the process. Those are the first four steps of the Audience’s Journey. 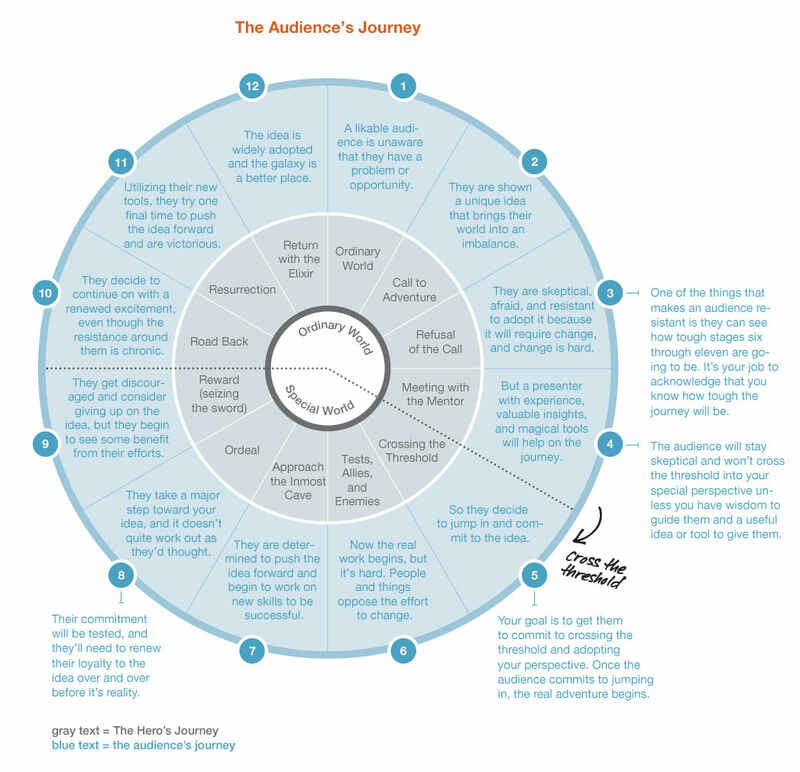 The diagram above shows the remainder of the twelve steps through which a great presenter leads her audience. If this feels familiar, it should. This journey forms the arc of every great story. 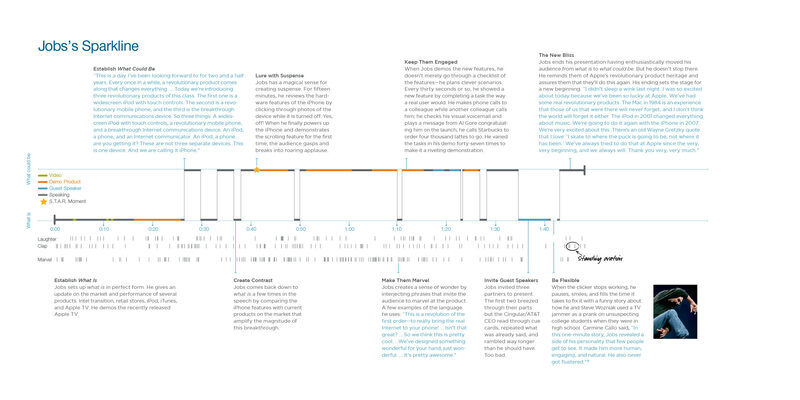 To prove the point, Duarte diagrammed the audience’s journey with Luke Skywalker in Star Wars and the book has many similar examples. Next, the book introduces us to the story template, which is a MadLibs-style fill-in-the-blank for crafting the arc of the story. 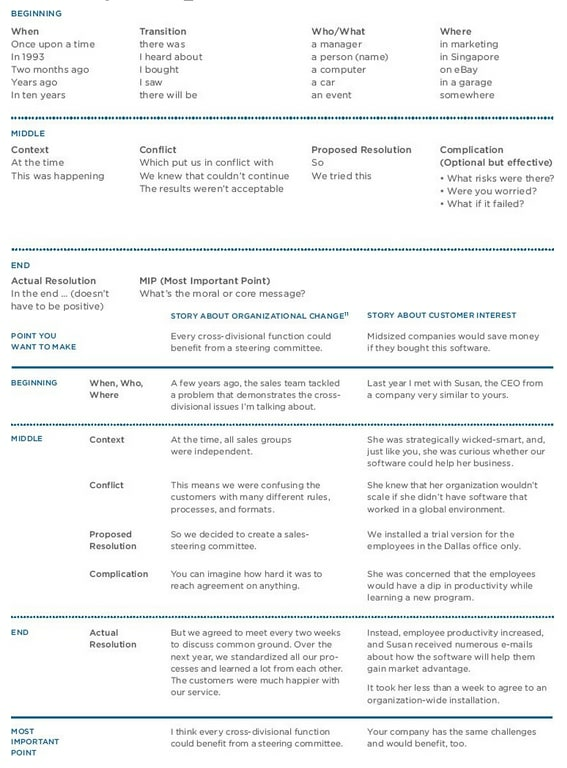 This template follows the Situation, Complication, Question and Answer philosophy and demands simplification of the storyline. As Duarte writes in her book, complexity kills presentations. Last, Duarte combines synthesizes the output of these two frameworks into a spark line, like the one above for the iPhone announcement by Steve Jobs. Time is demarcated along the x-axis. 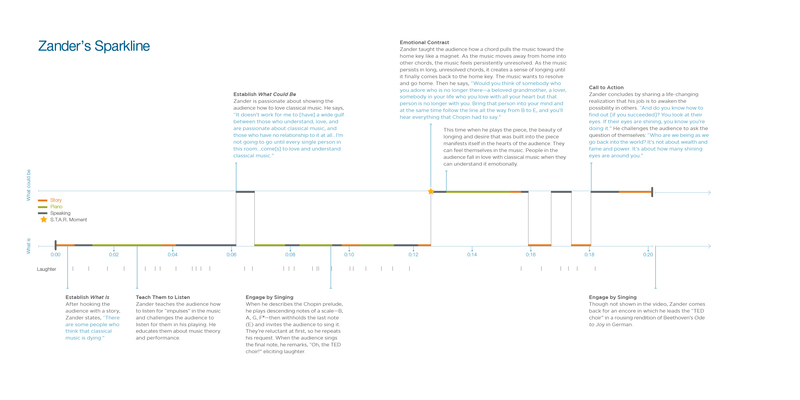 Along the y-axis, the spark line shows whether the presenter is talking about the present or the future. Along the bottom, Duarte has noted when the audience claps and laughs, and when Jobs marvels at his own product. The relationship between these four time series shows how well Jobs is able to convince the audience to see his vision and share his wonder for this product. 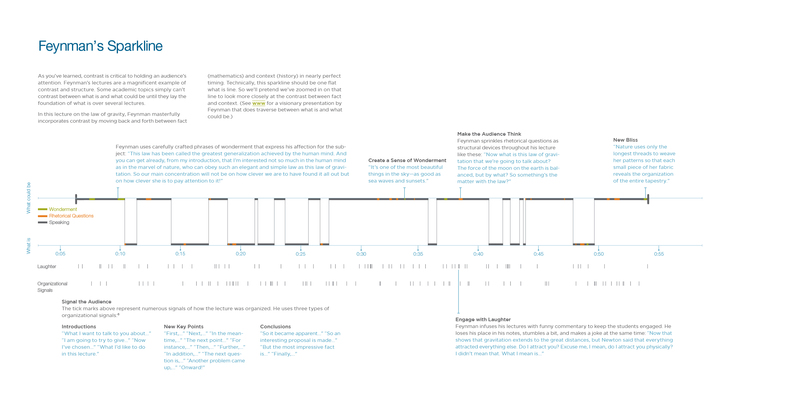 Spark lines can be great planning tools as well as great feedback loops to improve presentations. Great pitches oscillate between between what is and what could be. Duarte shares similar spark lines for Richard Feynman, physicist extraordinaire, and his lecture on gravity, and Benjamin Zander, conductor of the Boston Philharmonic and his TED talk on music, among others. In her book, Duarte dissects other great speeches including Martin Luther King’s “I Have A Dream” and Ronald Reagan’s Challenger Disaster announcement. The best presenters contrast the present and the future throughout the presentation and when down successfully, this seesawing drives the audience t o believe the presenter’s vision. Resonate is a powerful book because it reveals all the tricks of the magician presenters and shares the tools to craft compelling, memorable and trajectory-changing stories.